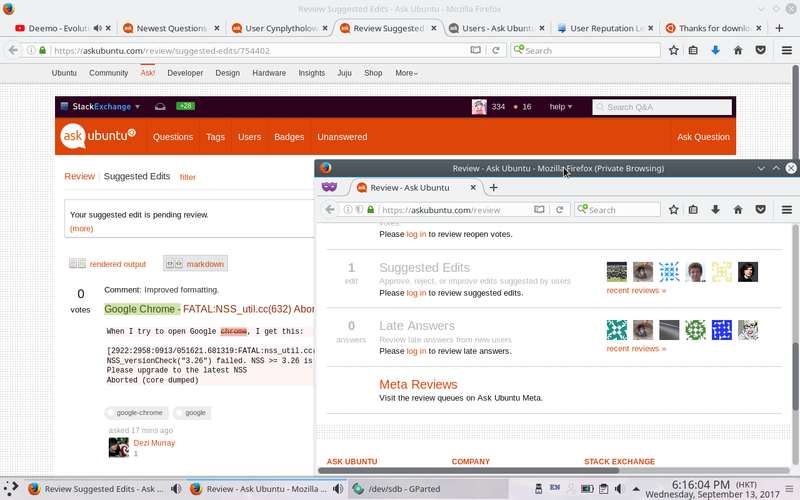 A lot of my edits, when I submitted to Ask Ubuntu, at first showed up in the counter in the suggested edits in https://askubuntu.com/review, but after the first reviewer approved my suggested edit, the counter goes back to 0 for 5 to 30 minutes before the counter goes back to 1. I thought this was normal behavior in Ask Ubuntu at first as I encountered this every time before I post this, but today it gets my nerves up too much that I posted this issue here. 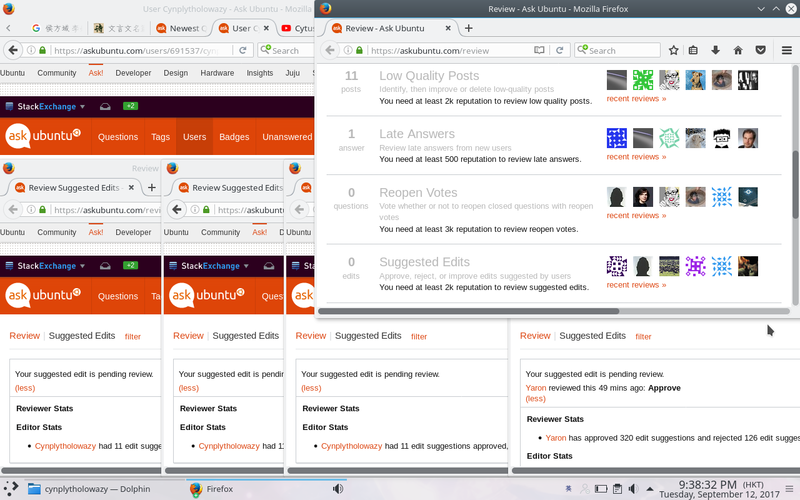 I just submitted 6 (I think) suggested edits to Ask Ubuntu, where 3 of them are approved by users who posted their questions. After a while (around 30 to 40 minutes later), I just got interested in seeing the number of pending suggested edits, and I got alarmed: 0 appeared in the page. I have never seen this issue before. Yes, one of my pending edit got approved my a reviewer, I understand that it might not show up in the counter of suggested edits, but how about the other 2? I see no reviewer approving or rejecting my suggested edits, and the counter of pending suggested edits still shows 0. I want to know what happened, as it affects the edit suggestions efficiency a lot, and I do not hope this issue will affect other users submitting and reviewing the suugested edits. Edit: I just checked again, my proposed edits are proposed more than 27 minutes already, no reviewers handle my edit suggestions, and the counter for pending suggested edits still shows 0. Edit 2： Updates again. The counter for pending suggested edits still shows 0, but 2 of my suggested edits have activities now. However, 1 of them still do not have any activities. I suppose some reviewer opened my suggested edit and go AFK. Edit 3: Incognito mode screenshot here. I got another pending edit, where I did not login, but the counter shows 1. The point is, Last time when I got to the review page, both of logged in one and incognito one shows a counter of 0. I believe that the counter will show the same for everyone. Open the reviews page in Incognito Mode, so you're logged out, and you'll see it. The review count won't reflect anything you submitted.